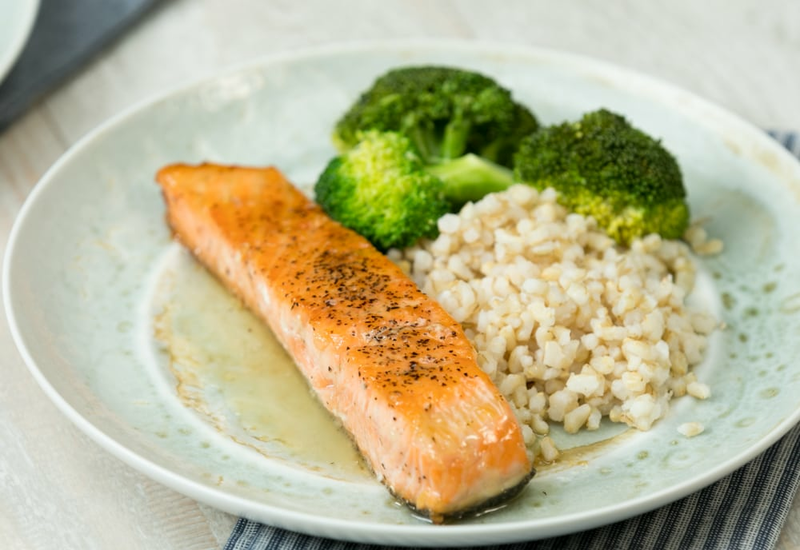 Like the title says, the salmon fillets in this recipe are flavored with honey and garlic for a quick, delicious main course. It's simple enough to make anytime, but also flavorful enough to make for a special dinner for two. All you have to do is season salmon filets with salt and pepper and sear them over medium-high heat in olive oil. Then, make a simple sauce of butter, garlic and honey to baste the fish. Finish with a squeeze of fresh lemon and dinner is served! Enjoy with brown rice and steamed broccoli for a healthy and fulfilling meal in minutes. Did you know there are up to seven different kinds of salmon you might find in your grocery store? They are all delicious, but King Salmon (also known as Chinook Salmon) is considered to be the best tasting. This variety has a high fat content making the fish rich in flavor. Per Serving: 790 calories; 52g fat; 29.7g carbohydrates; 51g protein; 189mg cholesterol; 672mg sodium. I loved this salmon! It was really delicious, simple but a ton of flavor. Next time I will probably try it on the grill. I paired it with spiralized zucchini, so yummy! Obsessed with this honey garlic salmon! So delicious and incredibly easy. I served it with spiralized zucchini for a light, low-carb dinner. This honey garlic salmon recipe is really delicious. As soon as I saw the video I went out and bought some fish. Something about the sweet honey and garlicky flavors together that just work. We served this dish with rice and broccoli, and really enjoyed the entire meal. You had me at honey and garlic! I used filet salmon (no skin) and garnished with sesame seeds. Simple recipe, great flavor. I've always stayed away from salmon with the skin-on, but now that I am older I have an appreciation for it. This simple recipe doesn't require much, and the flavor is amazing. Love the texture and taste!